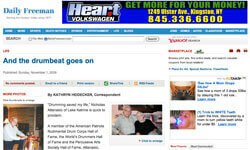 The Kingston, N.Y. Daily Freeman recently profiled 87-year-old rudimental bass drummer Nicholas Attanasio. Drumming since 1932, Attanasio has spent a lifetime performing and teaching others his skill. He is a member of the American Patriots Rudimental Drum Corps Hall of Fame, the World's Drummers Hall of Fame and the Percussive Arts Society Hall of Fame. Read the article at DailyFreeman.com. 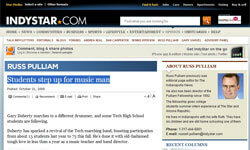 The Indianapolis Star recently featured local band director Gary Doherty for his work inspiring students by reestablishing the marching band program at Tech High School in the Indianapolis Public School system. As a band director in Texas for more than 30 years, Doherty held an active role with Drum Corps International's national network of Tour Event Partners before moving to Indianapolis to head DCI's OnQ educational division.